On 19th October 2017, WWE aired its 270th episode of NXT, taped at Full Sail University in Winter Park, Florida on 14th September. Our main event had some trios action in the form of NXT Tag Team Champions SaNItY (Eric Young, Alexander Wolfe & Killian Dain) taking on their persecutors, Undisputed Era (Adam Cole, Bobby Fish, Kyle O'Reilly). 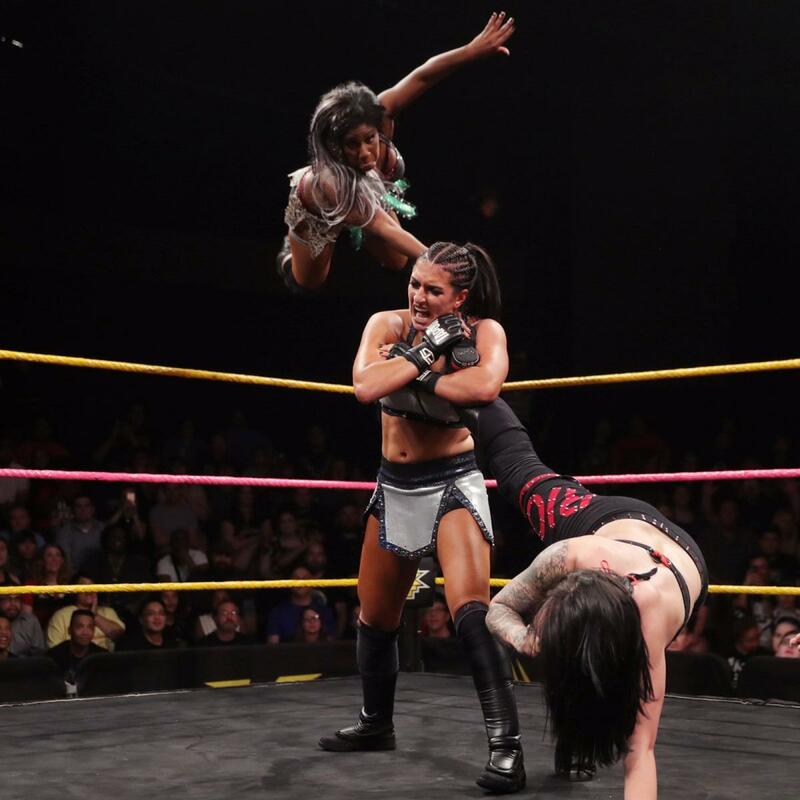 The undercard saw the second of three qualifying matches for the NXT Women's Title Fatal Four-Way as Ember Moon took on Sonia Deville and Ruby Riot, as well as Aleister Black vs Raul Mendoza and Kassius Ohno vs Cezar Bononi. But was it any good? It's nice that this match has a very different vibe to last week's in that it seemed to be pure pain from moment one (ish), Ruby and Ember attempt to start a three-way test of strength spot but Deville responds by kicking Riot in the gut before taking an O'Conner roll from Moon who is pulled off into a roll-up by Riot for a 2, on their feet and Riot hits a low angle rana on Moon but takes a lariat from Deville for a 2, backup and Riot hits an arm drag before lighting up Sonia with kicks and a running dropkick for a 2, Moon's back in and riot tries to do a headscissors-DDT combo taking out Deville but Moon lands on her feet, the two of them test each other's rope running and flips before agreeing they're both brilliant, Moon goes in with her own kicks but Riot hits a thunderous forearm, Moon goes to the ropes and a springboard crossbody for a 2 count, Sonia's back in and Ember throws Ruby into her before taking them both down with a running knee strike to Sonia but she's not down for long as she goes kicking wild on both opponents standing tall into the ad-break, back from the break and Deville's straight in with a pair of gutwrench suplexes for Moon and a sidewinder for Riot into the corner, Riot jumps to top rope and drives Deville to the corner with deadly nightshade before throwing Moon into her, Riot goes for a running kick on both competitors but Moon ducks as the kick hits Deville, throws Riot out of the ring and covers Deville for a 2, Moon goes to the ropes for another springboard crossbody but Deville spears her out of the air, Riot is back in and the two of them trade running strikes, Deville runs at Riot but Riot sends her through the ropes, she goes to follow with a tope but Deville takes her down with a forearm, Moon tries to sneak attack but Deville drives her into the apron, Deville climbs up and tries to go for an apron diving axe handle landing straight into a kick to the jaw from Moon, Riot follows out of the ring with a top rope crossbody, landing her ankle on the walkway, Riot hobbles over to Moon, rolls her back into the ring and hits her with the Wind-Up Kick off the injured ankle which Moon sells like a bullet made of trampoline hit her, before Riot can cover her, Deville is back in and get an ankle lock on the recent 'injury', Riot tries to rope break but this is a Triple Threat, Riot escapes briefly only for Deville to apply a fully standing ankle lock, before Riot can tap, Ember is up top and she hits a beautiful Eclipse top rope stunner on Deville who bounces out of the ring before Ember takes advantage of the broken Riot and rolls her up for the pinfall. This was dope as hell. All three competitors were made to look like they could have won at practically any moment during the match and for a sub-8 minute match. they really managed to pack in the content. While on the surface, this may have seemed more spotfest than the more psychological affair last week, it did have a fascinating change of style for Moon who utilised a lot of underhanded tactics, making her seem to be giving in to her desperation to be champion. There were occasional moments when it was clear that they were following the standard beats of a three-way dance with a lot of one-on-one encounters that change to a new one-on-one after someone gets thrown out but as a show opener, this was as energetic as you could want. From earlier today, we get some 'CCTV footage' of Roderick Strong apparently being friendly with Undisputed Era and by 'friendly' I mean they approach him, he looks awkward, they put a t-shirt on his shoulder he looks at them, hands the t-shirt back and give Adam Cole a pat of 'no thanks'. I hope for sonce this isn't heading where we expect. William Regal is being asked about who will be in the last match for the Women's Fatal Four Way when The Iconic Duo turn up to make sure that Billie Kay is in the match and Regal agrees, announcing a Battle Royal for the final spot. Next Week: Billie Kay & Aaliyah vs The Mae Young Classic. 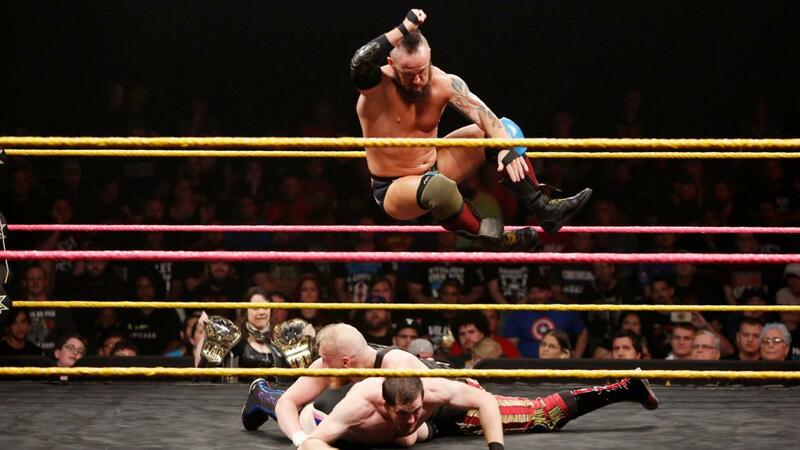 Aleister Black def. Raul Mendoza (2.10), Quick Squash m8. As the match started, Velveteen Dream hit the ring, trying on Black's jacket for a distraction. You may have guessed from the match time, it didn't keep him down for long. After the match, Black continued to refused to acknowledge Dream's existence, he's still there even if you don't look at him, lad. Mendoza got in a couple of flips so that was nice too. WWE.com didn't give me any photos of this interview so instead, I thought we'd all enjoy Aleister Black's best crab walk. So Drew is sat down for an interview, he was his suit on in a nice light blue with a well co-ordinated shirt and a tie-less open collar. He talks about how wild things have been in NXT since he became champ and how it's still weird to him to call himself 'champ', how this was a dream of his, about how he'd set goals and structures up to make his way back to the WWE and how he knew he had to be NXT champion, after he was fired the last time, it took a while to recover, especially considering he'd just moved into a new flat four days prior and had to tell everyone and it had taken a lot out of him but in the long run it inspired him to work harder to get back where he belongs, now, just four months after he officially re-joined, he's now champion and he wants to be an inspiration to everyone who has a dream, at this point Zelina Vega interrupts and kicks out the interviewer, taking over, she states that Drew and Andrade Almas are alike, they both were floundering and they both got second chances, just that Almas' second chance came in the form of Vega, not years away from the company, she wants to know why Drew has been avoiding Almas and if its because he recognises Almas is his biggest threat? Drew sees through her attempts to rile him up and says what he always does, anyone who wants a title shot just has to look him in the eyes, say he wants a fight and he'll give them a fight, he suggests going to Regal and organising the match, Vega says she knows the champ has more sway than her so why doesn't he make the match unless he's chicken (or a turkey, it's nearly Survivor Series, who wouldn't want to see the Gobbeldy-Drew-ker? ), Drew responds by saying if Andrade does want the match to come find him, look him in the eye and say it for himself before Vega storms out. This was a nice way of adding some extra shading to Drew's character who, much like Roderick Strong, seems to mostly be a loose extension of his own personality. It also helped build up to a potential NXT Title match for NXT TakeOver: WarGames, especially now we know Adam Cole's getting his title shot the night before, and cemented Vega's position as a steely, determined manager. All round good stuff. Kassius Ohno def. Cezar Bononi (3.10), Quick but not as much of a squash as you'd expect, m8. Bononi dominated till Ohno came back with a senton, big boots and a Rolling Elbow that Bononi sold like death for the pin. He's still getting there but there's good cause to put money on Bononi in the future. 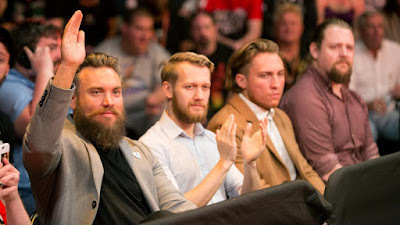 Ohno getting another win here all but guarantees they're building to something at the next TakeOver, in terms of other people who've got similar amounts of TV Time recently, it's almost certainly either Lars Sullivan or Johnny Gargano. Next Week: The Women's Title Contendership Battle Royal. PLUS: Johnny Gargano takes on Italy's own Fabian Aichner. The Wolfe & The Fish lock-up to start, Wolfe powers Fish to the corner, goes for a clothesline but Fish dodges and begins kicking at the hamstrings but Wolfe hits in square in the jaw like an axe, man, tag to O'Reilly who runs straight into a spinning bodyslam, tag to Young and the tag champs hit a drop toe hold-standing elbow drop combo, they place O'Reilly in the corner, Dain hits a splash and holds O'Reilly in place while Wolfe hits a running uppercut, Young hits a gutbuster and a forearm to the back of the neck earn an early 2 count, running the ropes and a ref distraction by Fish and a kick from Cole get things back in the Undisputed's favour, the three recent signees wear down Young who tries to power back hitting all three with strikes but a roundhouse to the head knocks Young out of the ring and into the ad-break, back from the break and Cole is grounding and pounding Young and he transitions to a grounded headlock, Young is powered to the corner, tag to O'Reilly and Fish is in aswell to hit a double wristbreaker and a double chest kick for a 2 count, tag to Cole who keeps hitting axe handles to ground Young tag to Fish who knees Young in the corner, tag to O'Reilly and both knee him in the corner before hitting a double suplex for a 2, O'Reilly whips Young to the corner and charges at Wolfe knocking him off the apron then at Young who uses the time delay to dodge, going for a tag O'Reilly drags him back with an ankle lock but gets kicked away, tag to Fish who just prevents a second tag but he's taken out with a kick, hot tag to Dain who hits the entire opposite team with clotheslines, a running crossbody on Fish and a front dropkick on O'Reilly, he then hits corner splashes on both men before going for a second on Fish who catches him with an elbow, Fish and O'Reilly both run at Dain, he catches them into a fallaway slam-Samoan drop combo, Dain picks up fish for a forward slam, a senton and a pop-up splash goes for a pin but Cole breaks it up, O'Reilly in to assist but Young and Wolfe hit him with an assisted jumping neckbreaker, Cole, now alone and surrounded, tries to escape but finds himself surrounded by insaniacs, he backs into the ring and is picked up by the hair by Dain and thrown one-handed into the ring but before Dain and Wolfe can execute their double team maneouvre, the Authors of Pain's music hits, causing Wolfe to charge at them as the Authors attack him and Dain, giving SaNItY a DQ victory. This was another solid performance by all involved. As a development of an angle (definitely not spoilers, maybe they're building to a three-way WarGames match...), the ending had a glorious, violent spectacle to it and SaNItY have that great Los Ingobernables-type gang mentality whereby they're only bad guys if you're not with him. 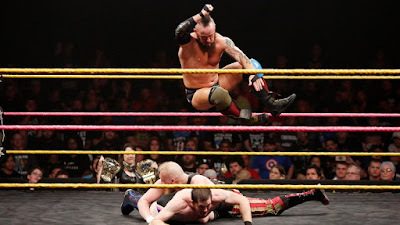 The match itself was a tad disappointing, despite some strong teamwork from Fish & O'Reilly, Cole is still yet to impress in NXT doing very little memorable in the match, overall it felt like it just never really got going, but not for lack of effort on either team's part. The Undisputed Era bail to the ramp, watching in horror as Authors of Pain lay out SaNItY hitting a clothesline-Russian leg sweep combo on Dain & the Supercollider double powerbomb on Wolfe & Young to close out the show. Ember Moon isn't celebrating until she's won the title, she also would like everyone to know that they should all be worried about her. A far more enjoyable show than last week's half-hearted effort with the entire undercard presenting one of the most enjoyable 45 minutes of NXT in quite a while. If not for a slightly flat main event, it could have been a lot better, luckily the Authors of Pain turning up and wrecking fools created an entertaining finish and set up more big things for the upcoming TakeOver.